In a recent interview, New York Times audience-development editor Alex MacCallum talked about the newspaper’s experiments with social and search optimization, but said that she didn’t see the Times as being in the same line of work as BuzzFeed — which she said was “chasing clicks.” I argued in a response that the Times actually is in the same business, in the sense that it needs to understand how social sharing is rapidly becoming the way in which people find content, whether from the Times or anywhere else. In my post, I argued that when it comes to understanding and taking advantage of social, BuzzFeed is clearly winning — and some data collected by the media-industry news site The Media Briefing shows just how much it is winning by. The site used collected sharing information from the service BuzzSumo, which tracked how many people shared articles from some of the major publishers, including the New York Times and BuzzFeed, during a week in November. According to the data, the average number of shares for an article posted on BuzzFeed (that is, the total number of shares divided by the total number of articles) was almost 8,000. The median — which means the number of shares in the exact middle of the sample, where half the examples are on the higher side and half on the lower side — was almost 1,000. And the New York Times? 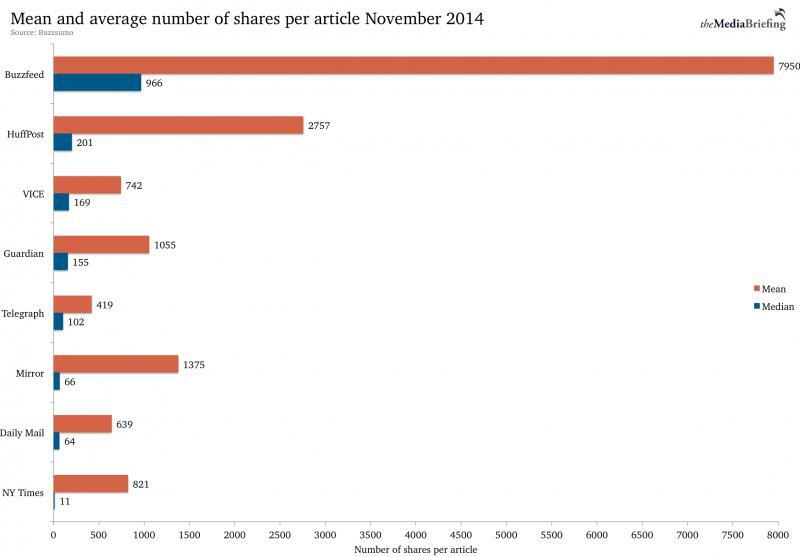 The average number of shares per article for that week in November was about 800, or 10 times fewer than BuzzFeed. But since the average can be distorted by one or two pieces that get huge numbers of shares, it’s more instructive to look at the median: here, the Times saw just 11 shares per article, compared with almost 1,000 for BuzzFeed. That’s two orders of magnitude, or 100 times smaller. Note: After this post was published, several people — including former NYT developer Michael Donohoe — pointed out that the sharing stats on the Times could be negatively affected by the amount of wire-service copy the paper puts on its site, which is estimated to make up as much as 75 percent of its published content. Virtually none of it would likely be shared, so that would tend to push the NYT’s sharing ratio down. “Same business” argument is a red herring – if your work as a media entity is not getting shared widely in social networks then something is seriously wrong and you need to fix it. 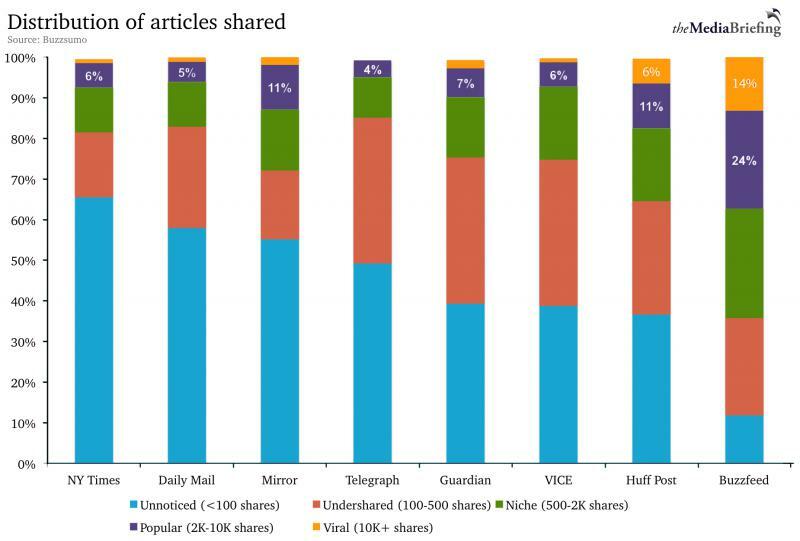 It would be a (more) meaningful chart if it showed the rate of sharing per article, to control for the differing levels of traffic to each site. I pity anyone who thinks NYT and BuzzFeed are in the same business. This isn’t exactly fair. The NY Times runs many articles with a limited audience. All of these smaller articles drag down the mean and median. If they want to compete with Buzzfeed, all they need to do is stop publishing 95% of the articles. It’s easy to guess in advance which articles won’t get much traction. But those articles are also deeply interesting to some of the readership. If they got rid of them, they would be toast. Sure, their averages and medians would go up, but the brand would be toast. At some point, people are going to realize that the crock pot recipe on slide 8 really isn’t mindblowing, and Buzzfeed will fall out of favor for the very things that made it popular. But when? That’s the question that makes the fortunes. Besides the wire articles, the New York Times also has a different mission. It is a news organization and needs to report on things that are unlikely to go viral to fulfill that mission. For example, an article reporting on a new policy (whether it is an wire article or by in house journalists) probably won’t be shared as much as an opinion piece about that policy (but might actually have more readership). However, I don’t think that nullifies your original point. Traditional news organizations are far too quick to dismiss new platforms. Buzzfeed might have a different mission, but it is in the same business. Maybe posting garbage/regurgitated content is worth doing away with, or, reducing the %. HuffPo puts plenty of AP up… NYT paywall prevents sharing. If they were smart, they would take off the paywall and article limit for anyone coming from a shared post.